Introduction: Duodenectomy is recommended in patients with Familial Adenomatous Polyposis (FAP) with Spigelman stage IV duodenal polyposis to prevent cancer. Pancreticoduodenectomy (PD) (both pylorus-sparing and classic), pancreas-sparing duodenectomy (PSD) and segmental duodenal resections are all surgical options. PD consists of removal of the head of the pancreas, common bile duct, and gallbladder along with the duodenum. The anastomosis in PD includes a hepaticojejunostomy and pancreaticojejunostomy. A PSD preserves the pancreas and includes anastomoses of the jejunum to the biliary-and-pancreatic-duct complex. We aim to evaluate the incidence and risk factors for new-onset pancreatitis in FAP patients after foregut surgery. Methods: We identified consecutive FAP patients following duodenal resection (PD, PSD, segmental duodenectomy) between 05/1992 and 01/2018 from our institution's Inherited Colon Cancer Registry. A history of pancreatitis preceding the surgery or those without follow-up data were excluded. Medical records were used to determine demographics and risk factors for pancreatitis. Pancreatitis was defined as 2 out of 3: i) typical symptoms ii) lipase three times the upper limit of normal or iii) radiography consistent with pancreatitis. Results: 77 FAP patients (51.9% male) with duodenal resection were identified. 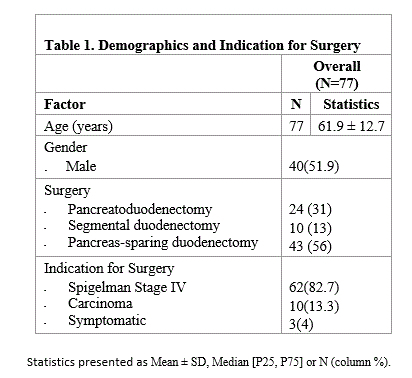 24 underwent PD, 10 segmental duodenectomy, and 43 PSD [Table 1]. 10/77 patients (13%) developed new onset, post-surgical pancreatitis. 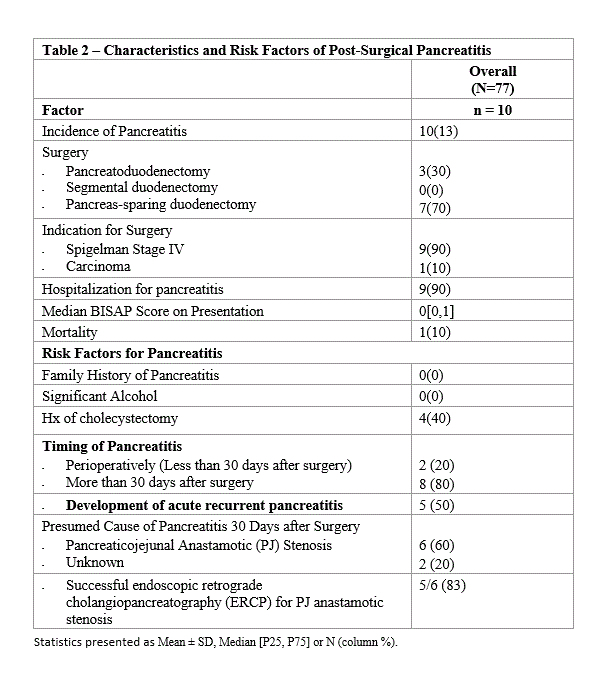 7/10 who developed post-surgical pancreatitis had undergone PSD and the remainder PD [Table 2]. 2/10 developed pancreatitis perioperatively within 30 days and 8 developed pancreatitis >30 days after surgery (range: 2-19 years after surgery). 9/10 required hospitalization for pancreatitis (median BISAP score 0, indicating likelihood of mortality at <1%). 1 death from pancreatitis occurred perioperatively (BISAP score 3). Of the 8 with non-perioperative pancreatitis, 5 developed acute recurrent pancreatitis (4 of whom underwent PSD) prior to endoscopic intervention. 6/8 required endoscopic retrograde cholangiopancreatography (ERCP) with balloon dilation for stenosis at the pancreaticojejunal (PJ) anastomosis (range: 1-2 ERCPs for successful treatment). ERCP was successful at dilating the stenosis in 5 of 6 cases. No patients had family history of pancreatitis or significant alcohol intake (>2 drinks/day males, >1 drink/day females). 4/10 had history of cholecystectomy, 1 remotely for gallstones and 3 during PD. Conclusion: FAP patients may develop pancreatitis after duodenectomy. It usually occurs years after surgery and commonly due to stenosis at the PJ anastomosis which can lead to acute recurrent pancreatitis. Evaluation of the PJ anastomosis should be considered for patients that develop pancreatitis after duodenectomy to evaluate for stenosis.